Complete this program and learn cutting- edge techniques to help clients deal with their unproductive worry, anxious thoughts, panic and fears. Discover proven strategies from CBT, ACT, DBT and MBCT to help your clients manage their anxieties and regulate their emotions. Judy Belmont, MS, LPC, author of bestselling books, Tips and Tools for the Therapeutic Toolbox series, and gain techniques such as the Feared Fantasy Technique, Hidden Emotion Technique, Flooding and Exposure activities. Integrate valuable ACT and DBT visualizations, relaxation and Mindfulness and Acceptance techniques and diary logs into your practice to help your client master their anxiety and track it between sessions. You will also receive valuable handouts and worksheets that you can use with your clients tomorrow! List simple and practical anxiety-reduction techniques to teach your client. 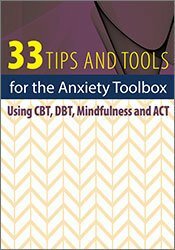 Identify trademark techniques from CBT, ACT, DBT and MBCT how they are effective in treating anxiety. Prepare activities that your client can do between sessions to lessen anxiety and track progress. Describe effective psycho-educational strategies that you can use immediately to help your client lower anxiety. Prepare valuable handouts and worksheets to help your anxious client. Judy Belmont, MS, has been a psychotherapist for 35 years, with a focus on practical, psycho-social and psycho-educational skills training. She is the author of PESI’s popular 4 book series, 86 TIPS for the Therapeutic Toolbox (Treatment Ideas & Practical Strategies) (PESI, 2006), 103 Group Activities and TIPS (PESI, 2006), 127 More Amazing TIPS & Tools for the Therapeutic Toolbox (PESI, 2013), and 150 More Group Therapy Activities & TIPS (PESI, 2016), which offers practical, action-oriented strategies to help people develop healthy life skills. Judy is the author of the Anxiety and Stress Solution Deck (PESI, 2019) as well. She is also co-author of the self-help book The Swiss Cheese Theory of Life. (Premier Publishing & Media, 2011). Judy is a national speaker on various mental health and wellness topics for a variety of populations, including mental health professionals, women’s conferences and expos and as well as workplace wellness programs. She maintains a private practice in Allentown, PA.
For U.S. and Canadian customers, a CE test is available for $9.99 USD per participant. International CE rates may vary; please contact our Customer Service at 1-800-844-8260 for more details. Certificates of Successful Completion may be emailed, faxed or mailed to participants completing the post-test/evaluation and paying the CE fee. Iowa Nurses: PESI, Inc. is an approved provider by the Iowa Board of Nursing. Provider #: 346. Nurses successfully completing these self-study materials will earn 2.4 self-study contact hours. Minnesota Psychologists: This self-study activity has been approved by the Minnesota Board of Psychology for 2.0 continuing education hours.